Menstrual cycle is a complex entity involving many interactions of the central nervous, endocrine, and reproductive systems, i.e., hypothalamus, pituitary gland, and ovaries. It has been observed that many pathophysiological states associated with menstrual dysfunction have an increased incidence in the recent past. Over the years, it has been established that stress and drugs could have a potential to affect the menstrual cycle in various ways. Dysfunctional uterine bleeding (DUB) is defined as a state of abnormal uterine bleeding without any clinically detectable organic, systemic, or iatrogenic cause. Data from the WHO's multicenter survey report the prevalence of excessive menstrual bleeding ranging from 8% to 27%., DUB is most common in extremes of the reproductive age. Among women aged 30–49 years, one in twenty consults the general practitioner each year with menorrhagia, making DUB one of the most commonly encountered gynecological problems. About 30% of all women report having had menorrhagia, and it accounts for two-thirds of all hysterectomies. The prevalence of the occurrence of DUB is found to be ovular (10%) and anovular or oligo-ovular (90%), the latter being the most common cause of abnormal uterine bleeding. Among psychological factors, stress is the most imperative factor affecting the menstrual cycle. Stress influences all the body systems through other neurohormonal connections, the hypothalamo–pituitary–adrenal (H-P-A axis) as well as hypothalamo–pituitary–ovarian axis (H-P-O axis). Studies demonstrate that the glucocorticoids released due to the stress put forth an inhibitory action on the gonadotropin-releasing hormone (GnRH), thereby distressing the ovarian function. Elevated levels of corticotrophin-releasing hormone (CRH) and cortisol also suppress the GnRH secretion and consequently decline ovulation. Thus, stress could significantly diminish reproductive functions in an effort to maintain homeostasis. Previous studies have found that the stress influences the incarcerated women leading to high rates of amenorrhea and menstrual irregularity. Evidence also suggests an association of sleep disturbances and disturbed circadian rhythm with menstrual disorders., Abnormal uterine bleeding is also associated with loss of health-related quality of life when compared to healthy women with the same age. DUB leads to significant direct and indirect costs as well as loss of productivity. The most common conventional management of DUB involves progestin therapy in varied doses based on the age. Low-dose combination hormonal contraceptive therapy (20–35 μg ethinylestradiol) is the mainstay of treatment for adolescents up to the age of 18 years. For women aged 40 years or older, before menopause, the treatment consists of cyclic progestin therapy, low-dose oral contraceptive pills, levonorgestrel intrauterine device, or cyclic hormone therapy. Although these treatments are found to be effective, they do have adverse effects on the overall health of the women. The drawback to medical therapy, in addition to side effects, is that the benefit lasts only while the patient takes the medication. Surgical options have concentrated mainly on endometrial ablation and hysterectomy, and it is unclear whether one is superior to the other in terms of long-term outcome and patient satisfaction. With the advent of adversities with conventional management, patients have started exploring complementary and alternative medicine (CAM) therapies for managing DUB. According to a survey, CAM therapies are commonly used by women for menstrual disorders to reduce pain and discomfort and yoga is among the top 5. The CAM therapies are found to be safe and known to enhance the quality of life in women. It has been demonstrated that regular practice of yoga has beneficial effects on both phases of the menstrual cycle by bringing physical and psychological well-being and by balancing neuro-endocrinal axis., In India, yoga therapy is commonly recommended for treating various noncommunicable diseases and for overall well-being.,, Yogic therapy helps in improving hormonal and biochemical changes related to H-P-O and H-P-A axes in polycystic ovarian syndrome (PCOS). Yoga Nidra is reported to be beneficial in managing the psychological impact of menstrual disorders., Overall, yoga is known to be beneficial in the general well-being of individuals in health and disease. To the best of our knowledge, there are no studies reporting the effects of yoga practices on the health status of patients suffering from DUB. Given the vital role of yoga in the management of several disorders relating to women, the current study was executed to ascertain the role of an integrated yoga module in the management of DUB. The present study was a parallel-arm controlled pilot trial to compare the outcome of participants assigned to experimental (yoga and conventional care) group with that of a wait-listed control (conventional care alone) group. Participants were randomly assigned to either yoga or control groups using a computer-generated program (www.randomizer.org) with a 1:1 allocation ratio. The ethics committee of the university approved the study. The variables to be recorded and the study design were described to the participants and a signed informed consent to participate in the study was obtained. Thirty participants out of 52 were found eligible for the trial. They were randomly allocated into two groups, namely yoga (n = 15, group mean age ± standard deviation (SD), 29.85 ± 4.45 years) and a wait-listed control group (n = 15, group mean age ± SD, 30.85 ± 4.42 years). One participant from each group dropped up during the follow-up period and therefore finally 14 participants in each group were assessed and interpreted. Participants were recruited from the gynecology departments of three leading hospitals in Central India. Participants satisfying the age range of 20–50 years and diagnosed for primary DUB with no underlying systemic pathology were included in the study. Females with benign and malignant pelvic lesions, coagulation disorders, hypothyroidism, liver diseases, and pregnancy were excluded from the study. [Figure 1] represents the schematic of the Trial Profile. The yoga group was trained in an Integrated Approach of Yoga Therapy (IAYT) specially designed for menstrual disorders [Table 1]. Yoga group practiced this protocol for 3 consecutive months for 60 min a day for 3 days a week. This IAYT protocol included special yoga physical postures (asanas), breathing techniques (pranayama), and meditation (dhyana) for menstrual disorders aiming reduction in bleeding and pain, reduction in stress levels that women undergo during that period, and overall well-being. The wait-listed control group received standard care under the supervision of the consulting gynecologist for the same duration of 3 months. They were offered general counseling and were asked to avoid any yoga-based practices during the experimental duration. After the intervention period, they were offered training in yoga for the same duration as the experimental group. ET: ET was assessed using routine gynecological ultrasound. In the current study, ET was measured at the 11th or 12th day of menstrual cycle. PSS: The Perceived Stress Scale (PSS) is a classic stress assessment instrument. The tool, while originally developed in 1983, remains a popular choice for helping us understand how different situations affect our feelings and our perceived stress. The questions in this scale asked about the subjects feelings and thoughts during the previous month. In each case, subjects were asked to indicate how often they felt or thought a certain way. PSQI: PSQI is a self-rated questionnaire that assesses sleep quality and disturbances over a 1-month time interval and probes clinically important and patient-relevant symptoms in the areas of sleep quality and quantity. PSQI is a 19-item self-rated questionnaire to assess the quality of sleep. It also includes a 5-bed partner or roommate questions, which are not included in the scoring. Statistical analysis was performed using IBM SPSS 21.0 (IBM Corp, Armonk, NY). Data were tested for normality and appropriate statistical tests were applied for respective variables. 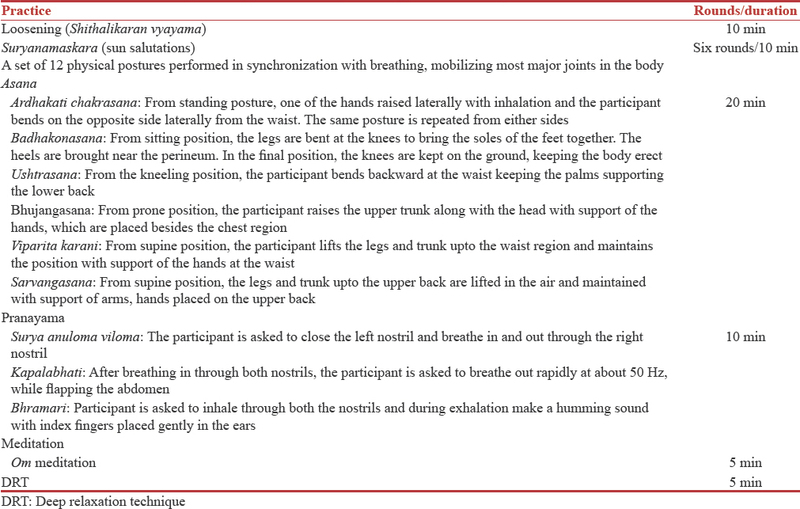 Paired sample t-test was applied to ascertain the within-group (pre-post) differences for both yoga and control groups. Independent samples t-test was applied to understand the between-group changes in the postscores of hemoglobin, PBAC, ET, STAI, and PSS. PSQI data were analyzed using repeated measures (RM) ANOVA. There were eight “within-subjects” factors, i.e., subjective sleep quality, sleep latency, sleep duration, habitual sleep efficiency, sleep disturbances, use of sleeping medication, daytime dysfunction, and global PSQI score. Post hoc analyses with a least significant difference were performed using Bonferroni correction and all comparisons were made with the respective “pre” states. For all the analyses, 95% confidence intervals are presented and P < 0.05 was considered statistically significant. Paired sample t-test and independent samples t-test were run within and between participants, respectively. There were no significant changes between the groups in hemoglobin levels, PBAC, and ET. However, the control group showed significant improvement (paired sample t-test, t = 2.381, P < 0.05) in the pre-post comparison of the hemoglobin levels. Yoga group demonstrated a significant reduction in the perceived stress (paired sample t-test, t = 2.622, P < 0.05) and STAI scores (paired sample t-test, t = 2.159, P < 0.05), whereas the control group had no significant changes. Yoga group also showed significant improvement in the PSQI global scores following the intervention duration (RM ANOVA, mean difference = 5.250, −5.250, P < 0.001) See [Table 2] and [Table 3]. The present study demonstrated significant reductions in perceived stress and anxiety among women suffering from DUB following the yoga intervention for 12 weeks in comparison to the baseline data. There were no significant changes observed between groups in the hemoglobin, ET, or the PBAC. Although there was a significant increase in hemoglobin in the control group when compared to baseline, the mean postvalue of hemoglobin in the control group remained lower than that of the yoga group. In addition, a mean change of 0.4 g% may not be considered clinically significant. There was no deterioration of hemoglobin levels in the yoga group when compared to baseline. The global scores of PSQI were significantly improved following the practice of yoga and were primarily associated with reduced sleep disturbances and the need for sleep medications. The role of yoga in reducing stress is well documented,, and our study concurs with the findings of earlier studies on yoga practices in menstrual disorders. An earlier study comparing the autonomic functions and psychological well-being of females suffering from premenstrual syndrome demonstrated enhanced autonomic functions and psychological well-being following the practice of yoga. There was evidence of significant reduction of the anxiety score in women suffering from PCOS. Nidhi et al. also demonstrated enhanced hormonal profile in women suffering from PCOS following a 12-week integrated yoga intervention. Another study compared the practice of Yoga Nidra, a relaxation technique in yoga, practiced for 6 months by the patients suffering from menstrual irregularities with nonpractitioners. The results of this study reported a significant improvement in psychological well-being and general health following the practice of Yoga Nidra. The current study indicated beneficial effects of yoga practice on sleep in patients with DUB. Earlier studies on yoga show improved sleep quality in different populations. Improvement in the sleep quality may also play a potential role in the regulation of menstruation, by restoring the overall hormonal balance. The role of perceived stress and anxiety in modulating the hormonal status is well documented. We postulate that yoga may influence the CRH and corticosteroid levels through reduction of perceived stress and anxiety. These hormones are known to inhibit the GnRH secretion and thereby responsible for the ovarian dysfunction in patients suffering from DUB. Therefore, IAYT might be useful in reducing the stress and anxiety and thereby balancing the H-P-O and H-P-A axes. The endocrinal profile could be used as a variable in future studies to understand the underlying mechanisms of beneficial effects of yoga in DUB. The observations from the current study suggest that there could be an improvement in the hormonal status of the individuals with menstrual disorders due to reduced anxiety, stress, and an improved sleep quality following the practice of yoga. We speculate that the trend of improvement observed in the variables of the current study could reach statistical significance with a larger sample size. These results therefore warrant further large-scale trials to establish the efficacy of yoga as a treatment modality for patients with DUB. Yoga, being a cost-effective and easy-to-adapt lifestyle intervention, could be a beneficial tool to complement the conventional therapies involved in managing DUB. Although the current study failed to substantiate the benefits of yoga in the objective variables in patients with DUB, the changes in subjective measures were significant to ascertain the beneficial changes. Overall, the results of this pilot study demonstrate that yoga practices can diminish perceived stress and anxiety and improve sleep quality in patients suffering from DUB and thereby improve their quality of life. Neinstein LS. Menstrual dysfunction in pathophysiologic states. West J Med 1985;143:476-84. Dutta D. Dysfuctional Uterine Bleeding (DUB). In: Hiralal K, editor. Text Book Of Gynecology. 6th ed. Delhi: Jaypee Brothers Medical Publishers (P) Ltd; 2013. Omran A, Standley C. Family Formation Patterns and Health: An International Collaborative Study in India, Iran, Lebanon, Philippines and Turkey. Geneva: World Health Organization; 1976. Omran A, Standley C. Family Formation Patterns and Health, Further Studies: An International Collaborative Study in Columbia, Egypt, Pakistan, and the Syrian Arab Republic. Geneva: World Health Organization; 1981. Farrell E. Dysfunctional uterine bleeding. Aust Fam Physician 2004;33:906-8. Berga SL. The brain and the menstrual cycle. Gynecol Endocrinol 2008;24:537. Allsworth JE, Clarke J, Peipert JF, Hebert MR, Cooper A, Boardman LA, et al. The influence of stress on the menstrual cycle among newly incarcerated women. Womens Health Issues 2007;17:202-9. Baker FC, Lamarche LJ, Iacovides S, Colrain IM. Sleep and menstrual-related disorders. Sleep Med Clin 2008;3:25-35. Baker FC, Driver HS. Circadian rhythms, sleep, and the menstrual cycle. Sleep Med 2007;8:613-22. Liu Z, Doan QV, Blumenthal P, Dubois RW. A systematic review evaluating health-related quality of life, work impairment, and health-care costs and utilization in abnormal uterine bleeding. Value Health 2007;10:183-94. Committee on Practice Bulletins – Gynecology. Practice bulletin no 136: Management of abnormal uterine bleeding associated with ovulatory dysfunction. Obstet Gynecol 2013;122:176-85. Cochrane S, Smith CA, Possamai-Inesedy A, Bensoussan A. Acupuncture and women's health: An overview of the role of acupuncture and its clinical management in women's reproductive health. Int J Womens Health 2014;6:313-25. Fisher C, Adams J, Hickman L, Sibbritt D. The use of complementary and alternative medicine by 7427 Australian women with cyclic perimenstrual pain and discomfort: A cross-sectional study. BMC Complement Altern Med 2016;16:129. Qu Y, Jia Z. Preface JCDR 2013 issue 2. J Cardiovasc Dis Res 2013;4:77-8. 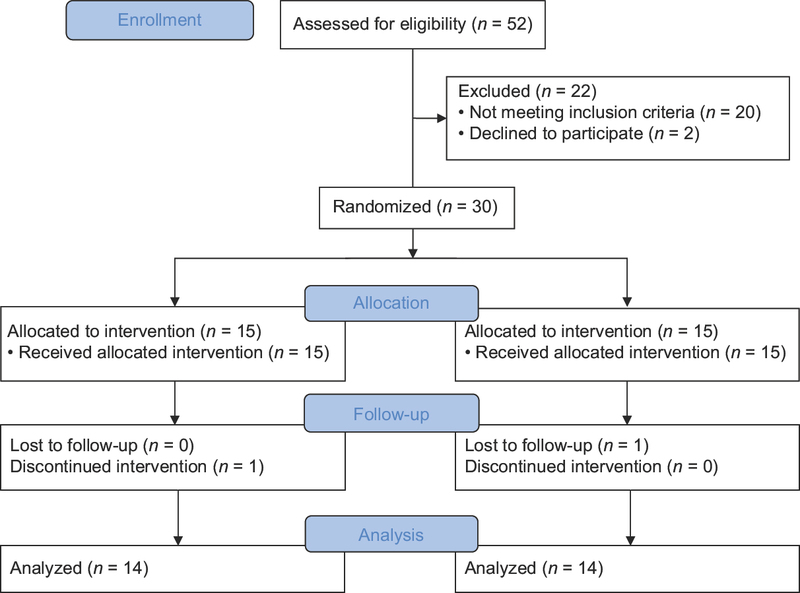 Nidhi R, Padmalatha V, Nagarathna R, Amritanshu R. Effect of holistic yoga program on anxiety symptoms in adolescent girls with polycystic ovarian syndrome: A randomized control trial. Int J Yoga 2012;5:112-7. Vinchurkar SA, Arankalle DV. Integrating yoga therapy in the management of urinary incontinence: A case report. J Evid Based Complementary Altern Med 2015;20:154-6. Raghavendra P, Shetty P, Shetty S, Manjunath NK, Saoji AA. Effect of high-frequency yoga breathing on pulmonary functions in patients with asthma: A randomized clinical trial. Ann Allergy Asthma Immunol 2016;117:550-1. Gowda S, Mohanty S, Saoji A, Nagarathna R. Integrated yoga and naturopathy module in management of metabolic syndrome: A case report. J Ayurveda Integr Med 2017;8:45-8. Nidhi R, Padmalatha V, Nagarathna R, Amritanshu R. Effects of a holistic yoga program on endocrine parameters in adolescents with polycystic ovarian syndrome: A randomized controlled trial. J Altern Complement Med 2013;19:153-60. Rani K, Tiwari S, Singh U, Singh I, Srivastava N. Yoga Nidra as a complementary treatment of anxiety and depressive symptoms in patients with menstrual disorder. Int J Yoga 2012;5:52-6. Higham JM, O'Brien PM, Shaw RW. Assessment of menstrual blood loss using a pictorial chart. Br J Obstet Gynaecol 1990;97:734-9. Nalaboff KM, Pellerito JS, Ben-Levi E. Imaging the endometrium: Disease and normal variants. Radiographics 2001;21:1409-24. Spielberger CD. Manual for the State-Trait Anxiety Inventory STAI (Form Y)(self-Evaluation Questionnaire); 1983. Smyth C. The Pittsburgh Sleep Quality Index (PSQI). J Gerontol Nurs 1999;25:10-1. Parshad O. Role of yoga in stress management. West Indian Med J 2004;53:191-4. Saoji AA. Yoga: A Strategy to cope up stress and enhance wellbeing among medical students. N Am J Med Sci 2016;8:200-2. Wang F, Eun-Kyoung Lee O, Feng F, Vitiello MV, Wang W, Benson H, et al. The effect of meditative movement on sleep quality: A systematic review. Sleep Med Rev 2016;30:43-52. Nowakowski S, Meers J, Heimbach E. Sleep and women's health. Sleep Med Res 2013;4:1-22.
van Eck M, Berkhof H, Nicolson N, Sulon J. The effects of perceived stress, traits, mood states, and stressful daily events on salivary cortisol. Psychosom Med 1996;58:447-58.